I’ve run across an interesting recent IPO by the name of Havyard Group ASA. Based in Norway, Havyard designs and builds specialty service ships. Havyard is majority owned by the Saevik family through their private company Havila ASA. Havyard’s original intended IPO price was NOK 36.00, which was then discounted by 7% to NOK 33.50. The discounted IPO price reaffirms my belief that expectations and enthusiasm surrounding Havyard are not high. Since the IPO, shares have slipped another 4.5%. Before discussing Havyard’s history and business segments, let’s review the company’s history in brief. Havyard was founded in 1999 in Norway and got its start building platform service vessels for the North Sea’s active offshore drilling market. Over time, the company expanded into various other types of specialty vessels and built up a world-wide clientele. Havyard has expanded beyond the oil and gas industry and now designs and manufactures ships for the fishing and aquaculture and offshore wind farm industries. The company expects these new markets to offer great growth potential. Havyard notes that most fish consumption is likely to increase substantially as the world’s population continues to increase and wild fisheries remain in danger of over-harvesting. Offshore windmills will only become more common and economical as wind technology improves and the world’s energy needs increase. Today, Havyard bills itself as a ship technology company focused on “Improving Life At Sea.” Havyard’s self-identification as a technology company is not mere marketing puffery; fully half the company’s operating income is earned by its ship and systems design segments. Here’s an example of Havyard’s output. The Lewek Inspector is a 110 meter inspection, maintenance and repair vessel designed for fuel efficiency and maneuverability in rough conditions. It was delivered to Forland Shipping in late 2013. Havyard has four operating segments. The largest by far is the “Ship Technology” segment, responsible for the actual construction of the company’s vessels. Havyard’s hulls are manufactured under oversight by a partner in Turkey, then tested and finished in Norway. This segment is responsible for the large majority of Havyard’s revenues, but only about half its operating income. Havyard’s “technological” segments, “Power & Systems” and “Design & Solutions” accounted for just 20% of the company’s 2013 revenues, but contributed 52% of operating income. The final segment, “Fish Handling & Refrigeration” is a newcomer. Havyard made its initial investment in this segment in 2012. 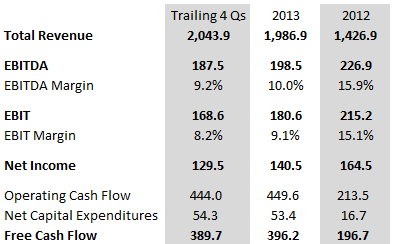 Fish Handling & Refrigeration accounted for 14% of 2013 revenues, but scarcely contributed to operating income. While this segment currently does not provide much in the way of earnings, Havyard considers it a strategic segment with good growth potential. The chart below breaks out Havyard’s 2013 results by segment. The figures diverge slightly from the company’s financial statements due to slight differences in presentation methods and are shown in millions NOK. Havyard’s 2013 results were off somewhat from 2012, even though revenues increased substantially due to the acquisition of the fish handling and refrigeration segment. The company attributes the decline in margins and earnings to the expense of developing and producing product prototypes, though I suspect the company also willingly sacrificed some margin to win contracts that allowed it to expand into new industries. Perhaps not a bad long-term strategy, even if short-term results suffer. Nonetheless, the company remains solidly profitable. Management expressed satisfaction with results for 2013 and the first quarter of 2014, noting successes in attracting first-time customers and in delivering new vessel models on time and on budget. 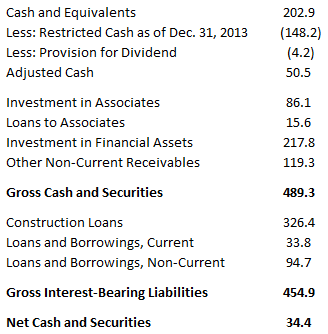 Financial results for the trailing four quarters through Q1 2014 as well as for 2013 and 2012 are presented below. Havyard’s balance sheet is healthy, with plenty of liquidity and net debt less than trailing EBITDA. Pinning down Havyard’s exact net debt is somewhat subjective due to the presence of substantial investments in associates. As of the end of 2013, Havyard listed a total of NOK 422.7 million in loans to and investments in associated companies, plus NOK 133.2 million unrestricted cash against total debt of NOK 295.2 million for net cash and securities of NOK 260.6 million. Assuming the level of restricted cash remained constant from the end of 2013, Havyard now has unrestricted cash of NOK 50.5 million after deducting dividends payable. The graphic below sets out the various assets and liabilities that go into estimating Havyard’s net cash and securities positions. “Other Non-Current Receivables” is Havyard’s term for long-term interest-bearing loans to asociates, the terms of which are set out in note 20 of the annual report. At quarter-end, Havyard had net cash and securities of NOK 34.4 million. At a recent trade price of NOK 32.00, Havyard’s valuation is enticing. The NOK 721.0 million market capitalization, combined with a positive net cash and securities position, yields an EV/EBITDA ratio of just 3.7 and an EV/EBIT ratio only slightly higher at 4.1. The company is cheap on an earnings basis as well at only 5.6 times trailing net income. These ratios are simply too low for a conservatively-financed, asset-light company with good prospects. I expect some raised eyebrows at my characterization of a shipbuilder as “asset light,” but you can check the financial statements to see for yourself. Depreciation accounts for less than 1% of Havyard’s annual revenues, an astonishingly low figure for an industrial company. In 2013, Havyard managed EBIT of NOK 180.6 million on average invested capital of only NOK 474.3 million, a 38.1% EBIT/Invested Capital figure. Havyard accomplishes this feat by outsourcing the capital intensive part of its manufacturing process, hull-building, to other companies. Though Havyard’s low valuation and reasonably good business prospects support a valuation much higher than where shares currently trade, the company does face risks that must be evaluated. The primary risk is a slowdown in the global oil and gas industry, and in the North Sea in particular. Though it has had success in entering new markets, Havyard’s results are still sensitive to the level of demand for oil and gas support vessels. A sustained decline in demand would have a serious impact on Havyard’s results. The company also has large exposure to the performance of its associated companies, mostly ownership stakes in and loans to ships and shipping companies. The book value of these holdings is equal to 61% of Havyard’s current market value, so their performance may have a serious impact on Havyard’s results and value. If these assets perform poorly, large writedowns may result. Investors should also remember that Havyard remains a controlled company. Havila ASA has a long track record of success in the maritime industry, but investors still must trust the Saevik family to manage Havyard well. Alluvial Capital Management, LLC does not hold shares of Havyard Group ASA for client accounts. Interesting find- I realize that you are not long, but I am curious how you interpret the quote that you included from the CEO. While this IPO in and of itself is not a capital raise as you point out, the quote suggests to me that some kind of future capital raise is likely. If “further development of the company requires more than we as a family company have the possibility to contribute.”, then this mere transfer of ownership by itself does not address that, does it? It would seem to possibly be the first step in a process of gaining access to capital markets. I’m just curious if that is your take as well. I’d like to be long but unfortunately Interactive Brokers doesn’t offer trading in this particular company. I do think a capital raise is possible down the line, but not imminent due to a few factors. First, the IPO price achieved was disappointing. Havila tried selling shares at NOK 36 and failed, so I think it’s unlikely they would get excited about selling more shares at NOK 32. Perhaps after a few successful quarters of growth and profits with a rising stock price, they would consider tapping the capital markets. Also, if the company had intentions of raising more capital in the short-term, I think they would have done it concurrently with the IPO. After all, why incur the expense of an IPO only to incur more expenses on a stock issuance just a few months later? If that were the plan, I suspect they would have done it all at once. Cool company. I like the diversification they are taking in the industry and their approach to low-capital cost manufacturing. 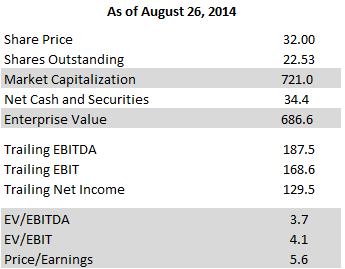 Something trading so cheaply always makes me interested, it’s hard to find companies below 5x EV/EBITDA these days. I am also somewhat familiar with oslo marine companies, I have done quite a bit of analysis on Awilco Drilling (extremely undervalued in the market trading at ~20% yield), to which I am long. However, I am skeptical about your calculation of net cash and securities. I think it is aggressive to consider some of those items cash if they are loans receivables and include them in your EV calc. I feel the EV/EBITDA multiple is low. To be conservative, I would think more in the range 4-5x. Nevertheless, cheap by most standards. Anyway, I am curious that you didn’t put a price target on it. What multiples are comps trading at? What is the gap between market and fair value? Are there any catalysts for this gap to close? PS I like your write-ups. Saw your one on ATNI and did my own analysis. Great find, I’ve spoken to management a couple times. Long that as well. Hello, I agree that the calculation of enterprise value is fuzzy. If any of these holdings turn out to be worth less than their book values, Havyard’s enterprise value is actually a good bit higher. One encouraging bit of news is that Havyard did sell off a stake in an associate at book value this quarter. Doesn’t guarantee the other holdings are fairly valued, but it at least suggests the values aren’t completely delusional. If I were an acquirer looking at Havyard, I’d have to consider each loan separately to assess if they could be sold at book value or not and adjust my offer price accordingly. It is possible that some of these loans would be marked down for non-marketability or assigned a discount if the creditworthiness of the borrower were in question. I avoid putting price targets on the companies I write up to avoid two types of e-mails and comments. One being angry missives accusing me of pumping or creating false hopes when a particular company doesn’t do well. The other being people asking me whether they should sell if a company reaches my price target. This blog is for entertainment, education and also to promote my RIA services, but I do not provide explicit recommendations on any particular security in order to avoid running afoul of my fiduciary duty. Glad you like my blog and I hope you will keep visiting. ATNI remains a favorite of mine. Good analysis. Where do you buy on the Oslo exchange? IB doesn’t have access. If you figure it out, let me know. I believe Fidelity offers Oslo Bors access, but I am locked out since I also trade through IB. Vanguard will place trades on the Norwegian Exchange on a case by case basis. Schwab customers have access to the Norwegian Exchange (one of nine exchanges they offer access to). The best way is with a Schwab Global Account allowing the investor to trade himself (vs broker assisted). Keep in mind that the commissions are steep as well as currency conversion fees. I too found it curious that the CEO’s comment seemed to state that the transaction was done to grow the business, where as in the beginning of your writeup, you stated the transaction was not to raise capital. How would you reconcile this? A few ideas on that. This IPO has been a long time coming, with a few failed attempts along the way. I don’t believe Havila was happy with the IPO price, but at this point I believe they went forward with it anyway in order to establish Havyard as a public entity and to get it on investor radar screens. There’s good reason to think the IPO was priced inefficiently. After all the, total offering was only USD $25 million, so it was hardly a major event and probably went unnoticed by the majority of the investor community. In the original prospectus, Havila had indicated it would sell between 4.20 million and 6.25 million shares. Havila wound up selling the minimum number of shares offered, plus a 10% over-allotment option. I believe that selling the minimum possible shares indicate’s Havila’s disappointment with the IPO price. In my opinion, Havila is hoping that Havyard can attract more investor attention and a more reasonable valuation by reporting a few quarters of growth and profits. With a public record of success, Havyard might be able to access cheaper capital than it could as a private subsidiary of a private holding company, and that requires Havyard being public, whatever its offering price. I believe it’s very possible that Havyard will seek to raise capital in the future, even the near future, but not at this depressed price. Thanks for the update. Second quarter wasn’t great, but there was a significant IPO expense and the company again sacrificed margin in order to expand into new markets. Probably a good long-term strategy even if the current results are depressed. I think what you said makes sense. It occured to me that by reducing their ownership stake, they have reduced their personal stake in any retained earnings re-invested in the business. So in that sense, they could commit the same internal capital necessary without having as much economice exposure to the result (obviously I know). Of course, that is distinct from raising additional capital but from an owners perspective, that sort of “capital diversification” could seem like raising money. If Hayvard does end up raising capital in the future, do you think they would do It by taking on debt, selling shares already owned by the parent, or issuing shares in a shareholder-dilutive manner? In other words, is dilution a real risk in this scenario? Havyard did just do a NOK 150 million bond issue, so at least for now they are happy raising debt capital. Third Avenue funds third quarter reports had a writeup on a competitor, Vard, a Norwegian company trading in Singapore (and majority owned by Fincantieri, an italian company). Their operating numbers are better but their balance sheet is worse, Anyway it’s worth looking at that company for comparison. IB has added HYARD now.